How was everyone’s weekend? Mine was great, but tiring! After finishing up a long day of babysitting with my friends yesterday, we all went out for dinner and frozen yogurt, and I got home too late to write a post. 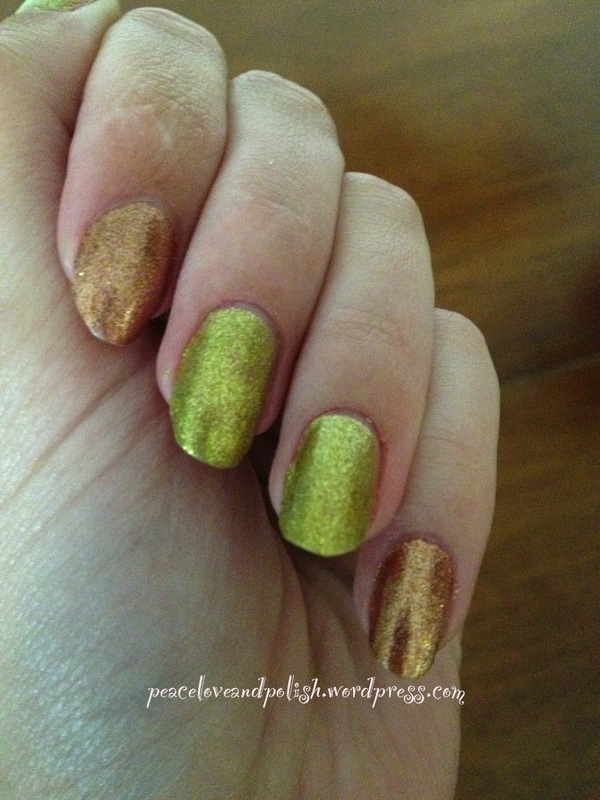 But today, I have a manicure with not one, but TWO OPI polishes to share with you! So let’s get started! On my middle finger, index finger, and thumb, I’m wearing “Simply Smash-ing“. 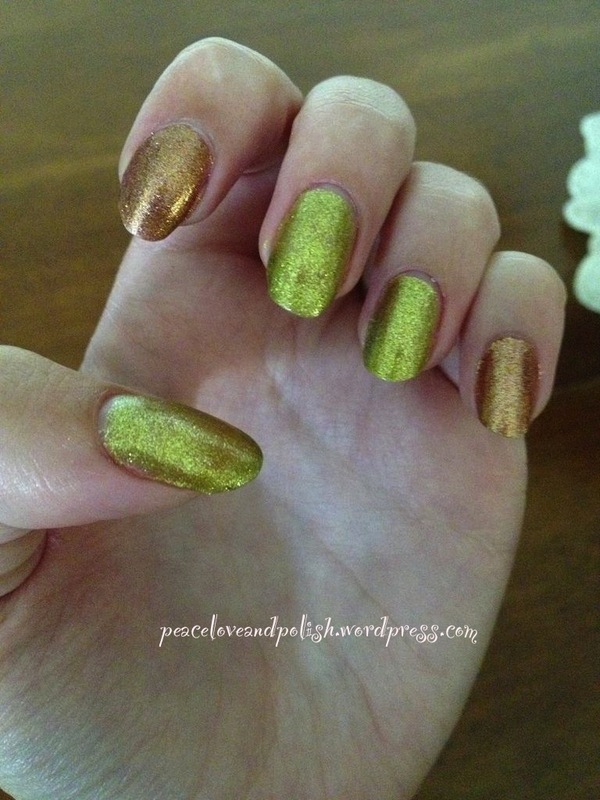 This is a beautiful gold-based green shimmer polish. The finish is almost foil-like. The glitter particles do not dry rough or textured at all- the finish is really nice on it’s own, and super shiny in the sun! I find that in the sun, the gold particles stand out more against the spring green ones. This color is from the Serena Williams “Glam Slam” OPI duo, and it also came with “Black Shatter” to wear overtop of it. These duos were released in January 2011, so they’re a bit harder to find these days. eBay should always have you covered, though the prices may vary. The other color I’m wearing on my pinky and pointer finger is “DS Glow“. The “DS” stands for OPI “Designer Series”, and most of the polishes in this collection (which runs more expensive than regular OPI colors) are holographic colors. 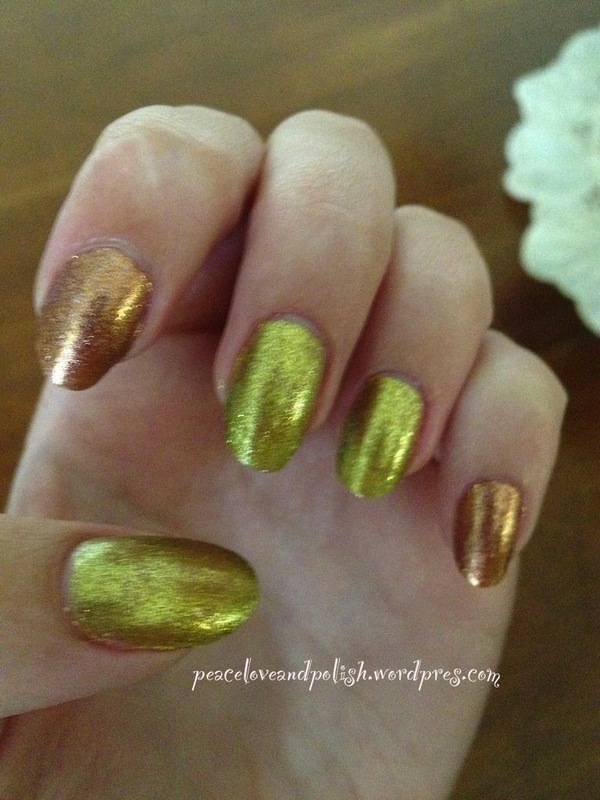 However, this color, Glow, is more of a foil-like finish, very similar to “Simply Smash-ing”. It’s a beautiful copper, and also dries smooth to the touch. 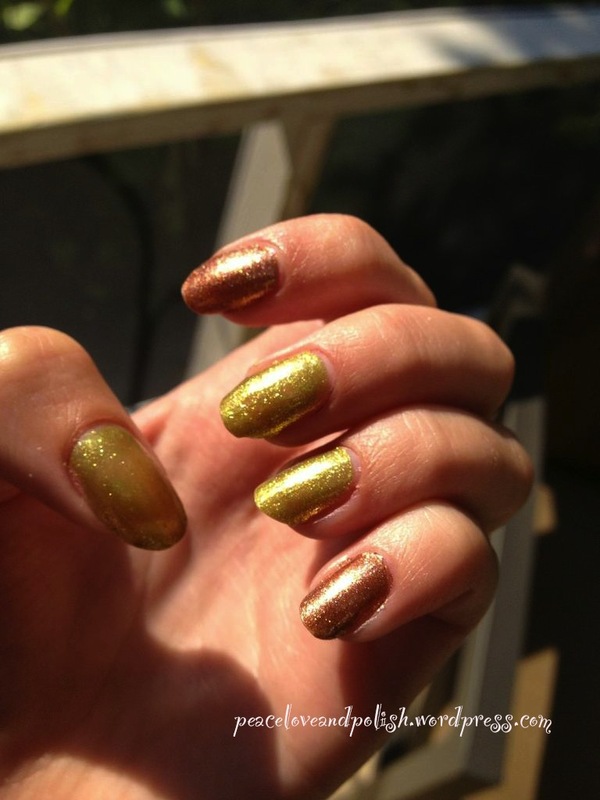 It’s from the Fall 2009 Designer Series release by OPI, so like “Simply Smash-ing”, it’s going to be hard to find. But if you ever stumble across it, I would highly recommend it, it’s a beautiful shade! Below are pictures of my mani, no top coat, base coat is Nail Envy by OPI. 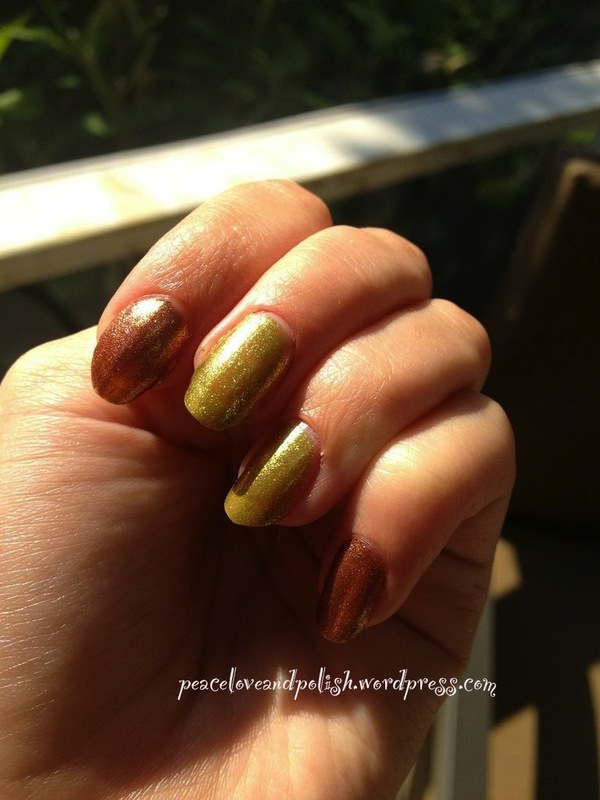 So what do you think of these two stunning polishes? Do you think they work well together, and will you be hunting them down for your collection? In other news, my beautiful long nails are going away soon 😦 I have to cut them short for piano. So be ready for short nail swatches in the near future!